The complete blood count, or CBC, is one of the most frequently ordered laboratory tests. The CBC is a valuable screening test that provides important diagnostic information. Tests measured as part of the CBC determine the number, type, percentage, concentration, and quality of various blood cells. These tests are performed simultaneously, usually in less than a minute, using an automated hemotology analyzer. In some situations, such as very low or very high results, or when an abnormal cell population is identified, manual celll counts or manual microscopic examinations are done. A differential white blood cell count or "diff" and platelet count may need to be ordered specifically if they are not included in the CBC. Parameters for normal laboratory values differ among age groups, genders, and laboratories. The laboratory references provided in this course are meant as a guide and are not intended to replace those of your institution. The average adult circulates approximately 5 liters of blood, divided into approximately 3 liters plasma and 2 liters formed elements or blood cells. 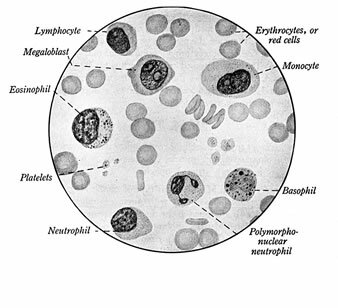 Red blood cells (erythrocytes), white blood cells (leukocytes), and platelets (thrombocytes) are produced in the bone marrow. Red blood cells are much more numerous than white blood cells and platelets. For valid CBC results, it is important to take several considerations into account. If a CBC is ordered at regular intervals, such as every day or every other day, the blood should be drawn at approximately the same time to avoid physiological fluctuations that normally occur at certain times of the day. The patient's hydration status significantly alters CBC values. For example, large volumes of intravenous (IV) fluids can overexpand the liquid or plasma component of peripheral blood, diluting the percentage of formed blood cell elements. On the other hand, dehydration can cause hemoconcentration, decreasing the plasma component of blood. This results in blood cell counts that are misleading because the numbers of formed elements in the blood is disproportionaly inflated. When patients are kept NPO for surgery or other procedures, the risk of dehydration and alterations in some aspects of the CBC is increased. All other factors remaining the same, how does dehydration affect hemoglobin content? Take a look at this electron microscope view of red and white cells, and platelets, from Puget Sound Blood Center.